China National Offshore Oil Corp (CNOOC) has pledged to invest about $3billion in its existing oil and gas operations in Nigeria, the Nigerian National Petroleum Corporation (NNPC) stated on Sunday. Yuan Guangyu, the Chief Executive Officer of the Beijing-based Corporation, made the pledge when he led a team of CNOOC top executives on a visit to the NNPC. According to the managing Director of NNPC, Dr Maikanti Baru, the corporation was open to new investments and would foster meaningful and mutually beneficial relations with credible entities like CNOOC. 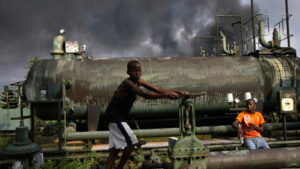 NNPC launched a bidding process in 2016 to find partners to overhaul ailing refineries that produce very little petrol because of decades of mismanagement, leaving Nigeria reliant on imported oil products. Shell, Chevron, Total, ExxonMobil and Italy’s Eni are major producers in Nigeria through joint ventures with the state oil firm NNPC. Last year, NNPC signed financing agreements with Chevron and Shell worth at least $780million to boost crude production and reserves in Africa’s most populous nation. The corporation has been holding talks with other oil majors over new finance agreements for joint ventures. The three existing refineries — in the cities of Port Harcourt, Warri and Kaduna — could add total capacity of 450,000 barrels per day (bpd) if refurbished. Nigeria, a member of the Organization of the Petroleum Exporting Countries, is Africa’s biggest crude producer. Posted by Steven Addamah on July 16, 2018. Filed under Finance. You can follow any responses to this entry through the RSS 2.0. Both comments and pings are currently closed.